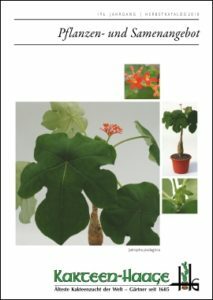 The latest catalogue is available to download as a PDF document here. You may order via mail using the form provided in there, or – much easier – through our online shop. Our latest catalog is valid until spring 2019 when the next Kakteen-Haage catalog will be published. I agree that the data provided may be used to contact me, can be processed and used. 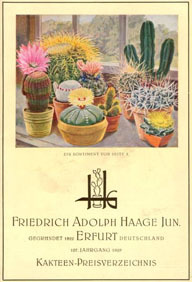 Kakteen-Haage cataloges are shippet around the world since 1824. Discover here some of them.